Bookmark placing ribbons for volleyball, printed and ready to ship. 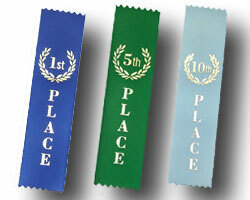 Stock Bookmark Type 1 5/8" x6" Placing Ribbons 1st-6th, participation, participant and honorable mention. Stock Bookmark Type 2" x 8" Ribbon, 1st-10th places, participant, honorable mention, and more titles.